The Michigan Maritime Museum offers a variety of on-water experiences, providing great adventures for the whole family! All boat rides include Museum admission. More Than Just A Boat Ride! The dramatic story of Friends Good Will speaks to the history of commerce in the early 1800s, as well as her pivotal role in the War of 1812. We are proud to be home to Friends Good Will and be able to provide our visitors with a unique on-water experience aboard this historic replica tall ship. Stand at her bow, feel the wind on your face, hear the crack of her billowing sails and her 6-pound pivot cannon. Do more than imagine how seamen felt as they set sail for uncharted courses--experience it for yourself. For more information on Friends Good Will history, please visit our webpage regarding Friends Good Will. Lindy Lou is an electric powered replica river launch. 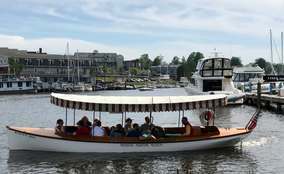 This cruise provides passengers with a chance to recapture those days from the late 1890s through the 1930s when launches plied the Black River, delivering guests to resorts, taking picnickers to up-river parks and pavilions, and generally helping fill the lazy hours of summer with relaxing diversions. 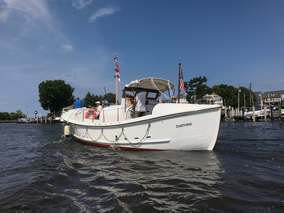 Lindy Lou makes daily cruises on the Black River (May through October), boarding at the Museum and cruising first downstream to the river clock at the foot of North Shore Drive, then traveling upstream to the covered bridge on the North Branch of the river and finally returning to the Orley Dock at the Museum. Each cruise covers about six miles and lasts for one hour. The hull of the launch was constructed in the winter of 2010 in Slocum, Rhode Island, by the Beckmann Boatshop. Made of fiberglass, it was formed on a mold taken from an original Truscott River Launch. Truscott Launches were made in St. Joseph, Michigan and could be found on lakes and rivers throughout the United States at the turn of the century. Like many launches of that period, Lindy Lou is powered by an electric motor. All the finishing work on the launch, including cutting and installing cherry wood decking and building a structure to support the craft's canvas top, was done by Museum staff and volunteers in the Padnos Boat Shed on the Museum's campus. Experience a short on-water excursion on the Museum's USCG Motor Lifeboat 36460! The 36460, built in 1941, starred in the Disney film The Finest Hours and represented the 36500 that accomplished the most daring rescue in Coast Guard history of the Pendleton in 1952 off the coast of Massachusetts. The USCG 36460 goes out on the hour, starting at 10:45 am until 3:45 pm. Trips last for 20 minutes and take up to 6 passengers. Tickets are $15 per person. Call the Museum at (269) 637-8078 or stop by the Ship's Store to purchase your tickets today! We are launching public excursions aboard our 1929 Chris Craft Cadet Merry Time for the 2018 season! For $200, you and three friends can spend an hour of private chauffeured luxury on the water. If interested in a private charter on Merry Time please call the Museum at 269-637-8078 for availability. Bernida does not replicate history. She is history. Designed by Geo. Owen and built by Lawley, giants within and during the golden years of American yachting, Bernida was launched in 1921 and sailed from the Corinthian Yacht Club of Marblehead, Massachusetts, itself an icon of yacht racing history. Bernida is a Universal Rule R Class Sloop and a thoroughbred racing yacht. She made her way to the Great Lakes in 1925 and won the inaugural Bayview-Port Huron Mackinac Race later that summer. She won again in 1927. After spending some seasons in Holland and Pentwater, she was lost for a time and later discovered in a barn near Frankfort, Michigan. After refurbishment in 2010, she entered the Bayview-Port Huron to Mackinac Race in 2012 and repeated her victory of 87 years before. 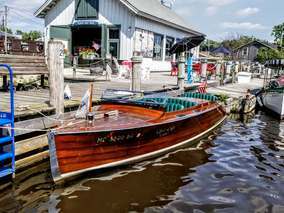 She was donated to the Michigan Maritime Museum within weeks of her triumph and sails exclusively with volunteer captains and crew. She is fast and elegant; like the 1920’s. She can carry up to four passengers at a time. Come join the Museum and the crew to experience Bernida yourself! By appointment only; call the Museum at 269-637-8078 ext.1 for directions on booking directly with a Bernida captain. Tickets are $50 per person for a 2-hour sail. * Children are welcome on Bernida and must be at least 12 years old to sail. *Payment due at time of sail. Flashback is a 19ft Lightning one design class racing sailboat. The Lightning was designed by the venerable Olin Stephens to a strict set of specifications. The idea is that identical boats would more fairly test the skill of skippers and crew. South Haven was the headquarters of the International Lightning Class Association in the early 1940’s. After WWII, middle class America took to racing far smaller and moderately priced sailboats than the wealthy of the previous decades. Flashback was built in 1956 and still sports her canvas deck, mahogany trim, transom and rudder and beautiful Sitka spruce spars. She was raced competitively for many years and went undefeated in 1980 while racing exclusively against far more modern fiberglass models. Flashback is skippered and crewed by qualified members of the Michigan Maritime Museum. If interested, please visit our Membership/Volunteer page to learn more.